The Simplicity is the first in our Rock Solid Collection. This Spa Features seating for 4 people and is Roto Molded for a hard durable Shell inside and out. This is a 110volt Plug & Play Model that requires little consumer set up. Most Spas look great in the showroom, but it is important to ask yourself how this spa will look in a few months - or years. For this reason, you should consider the material used in the spa's shell in addition to the spa's inner workings. Dura-Bond shells are manufactured with a pateneted four-layer strengthening system called Dura-Bond. This exclusive system combines the beauty of Acrylic Plus with a layer of ABS, then a layer of strengthening material. This high-density material has all the strengthening concern. The process is completed with a thick insulating layer of polyurethane foam. Acrylic Plus acrylic is a non-porous material that resists stains, like build up lotions and body oils, which can ruin non-acrylic spas. This material keeps its shine and color despite sanitizing chemicals, high temperature, and exposure to sunlight. Its durable surface resists chipping, cracking, and denting. Acrylic Plus is easily maintained with a sponge and mild soap. No additional polishing or waxing is needed to keep its lustrous appearance. It's about 4 feet deep from center to top. Can this product be saltwater based? This unit can not be saltwater based. Does this spa have a filtration system? The spa does have a top loading filtration system installed in it. Where are the Lifesmart spas manufactured and by who? They are made for Lifesmart by Free Flow Spas in Ontario, Canada. What is the maximum temperature of the water able to be produced by this tub? 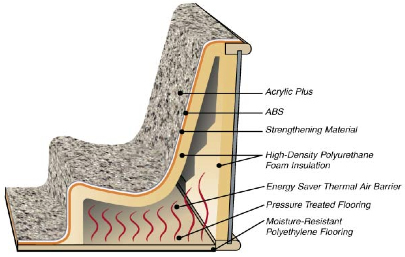 A Answered on 8/29/2010 by InyoPools Product Specialist Patrick P.
The Simplicity spa can maintain a max temp of 104 due to its energy saving insulation.